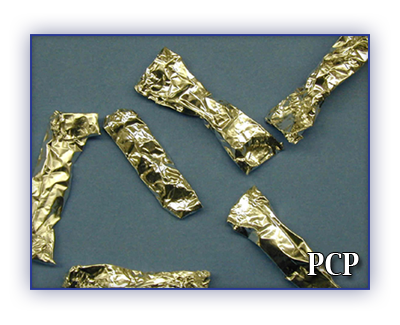 PCP can be sold as a powder, liquid or tablet, and can be smoked, swallowed or injected. It is sometimes passed off as LSD, marijuana, or other drugs. PCP is sometimes taken with LSD and is often sprinkled on marijuana and smoked. The effects of PCP may vary greatly, more so than most street drugs. It has both stimulant and depressant effects. These effects can include a sense of separation from one’s surroundings and difficulties in concentrating and communicating. With higher doses, some people become paranoid, terrified, and either aggressive or passive. This experience is referred to as a “bad trip” and may last several days. Some, but not all, users experience an intense euphoria. Occasionally, people who have taken PCP have been injured in accidents caused by drug-induced confusion. Some people have died as a result of accidents caused by this confusion. There are not many people who use PCP on a regular basis. Extended use can lead to persistent speech problems, depression, anxiety, or memory loss. Some users may experience flashbacks in which a sensation or hallucination may recur days, weeks, or months after the drug has been taken. Anxiety and withdrawal from social situations may also occur. It is impossible to predict the behavior of someone who has taken PCP. Users develop a condition similar to schizophrenia. Users can become aggressive, violent, paranoid, and delusional. Users can also have auditory hallucinations. Tolerance is the body adapting to the presence of a drug. When tolerance to a drug increases, more of the drug is necessary to achieve the same effect. Users can build up a tolerance to PCP. Some people who use PCP become dependent on it. Compulsive daily use and strong craving for the drug are not unusual. The effects of PCP are extremely unpredictable. Both short-term and long-term effects are serious and will differ for each person. As well, the user may experience different effects each time the drug is taken.